We were met as we arrived with welcome pack ,and were informed of local attractions restaurants etc. We were there as it was our anniversary and were presented with a cake which was much appreciated . On our departure we had a gift pack given to us with local products. Our host were very attentive and were very keen to ensure we enjoyed our stay which we did ! The suite was great of course but more importantly, the host were really nice, and gave us a lot of good councils to visit the neighbourhood. It was a real pleasure to stay at this place. Family was really nice and helpful and location itself was great. Beach is just across the road and not so crouded like it was in Sitia itself. It takes only 10-15 minutes to get to Sitia center and to bars and tavernas, so very cinvinient. Yet the place is quit and that's what you need if you want to spand atime with family/children or just to relax. I would like to say thanks to the Family! Appriciate you help and support during our stay. Be sure we would be back! I could highly recommend these lovely villas! This is an amazing spot to stay. The owners are beyond kind and helpful. We have rented a lot of apartments/condos in many locations all over the world and this one was probably the best stocked/organized of any of them. They've thought of everything.... salt&pepper sugar milk, paper products, coffee filters, soap and towels for all the appliances, etc. etc. Most places leave these things out and it's annoying to have to purchase for a few days stay. We wish we could have stayed longer and hope to come back asap. Most friendly and helpful owners, so lovely and great first impression of the villa. Everything about the Villa was exceptional. It was clean, stylish, well equipped and with excellent facilities . We were also given a coffee pot for our greek coffee. The beach across the street is also very nice and the Villa is located 10 min walking from the city center of Sitia. I could go on but suffice it to say I was very pleased with my stay, and although short (6 nights) and sweet this time, I hope to be back for a longer visit in the future. Walking distance to city and very good starting point to explore east coast. Very good standard of the room. Super nice and helpful owners. Great view. Très belle chambre. Beaucoup de gentilles attentions. Nous avons eu l'impression d'être reçus comme des amis. Allez les voir ils sont exceptionnels ! Die Gastgeber Despina und Kostas sind sehr nett und hilfsbereit. Das Apartements sind sind sehr grmütluch eingerichtet. Lock in a great price for Blue Horizon Villa & Suites – rated 9.9 by recent guests! Located in Sitia, the beachfront Blue Horizon Villa & Suites feature a well-tended garden, an outdoor pool and a sun terrace overlooking the Cretan Sea. It offers elegantly decorated accommodations with free WiFi access and a bathroom with hydromassage shower cabin. The center of Sitia is 1,650 feet away. Fitted with carefully chosen furnishings, top-quality mattresses and linen, and eco-friendly materials, the units at Blue Horizon Villa & Suites have a fully-equipped kitchen with oven, refrigerator, toaster, microwave and coffee maker. Air conditioning and a LED TV with satellite channels are also available. Some units also include a fireplace, a washing machine and a dishwasher. A common seating area, a shaded dining area and BBQ facilities can be found in the garden. Free sun loungers and umbrellas are also available. Agios Nikolaos is 43 mi from Blue Horizon Villa & Suites and the famous palm forest of Vai is 16 mi away. The nearest airport is Sitia Public Airport, 1.2 mi from the property. Free, on-site parking is provided. This property also has one of the top-rated locations in Sitia! Guests are happier about it compared to other properties in the area. 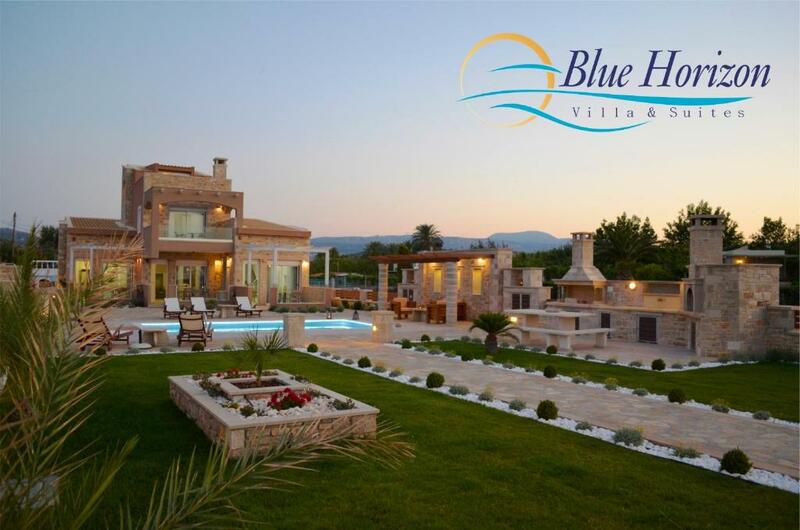 When would you like to stay at Blue Horizon Villa & Suites? This suite has air conditioning, patio and dining area. This villa features a balcony, private entrance and microwave. The Vasilakis family welcomes you to Blue Horizon Villa & Suites and wishes you an unforgettable stay! Blue Horizon is a newly built, beachfront, semi-detached complex that sets high standards of luxury. It has been designed with luxury holiday living in mind that blends into the local landscape and has many unique architectural and environmentally friendly features throughout. The complex is comprised of three semi-detached, fully furnished luxury residences (East, Central and West), combined in one villa. Each one has its own independent entrance with a private veranda with majestic sea views. It can accommodate up to 3 families of friends or relatives, (up to twelve guests), who can enjoy the exclusive use of the complex, keeping their privacy at the same time! It comprises 4 bedrooms, 3 living rooms, 3 open-plan fully equipped kitchens, 3 bathrooms with hydro-massage and 1 guest toilet. On the ground floor, the East and West parts comprise a comfy living room with a sofa bed, an office corner, an open-plan fully equipped kitchen and a bathroom. The interior marble stairs lead to the bedroom with a queen size wooden bed. The central part sprawls across 3 floors. The ground floor comprises a cozy living room with a fireplace, a sofa bed and an office corner. The open-plan fully equipped kitchen and dining area are located on the same floor aside the living room. There is also a guest toilet. The spacious master bedroom with a king size wooden bed is found on the first floor, enjoying an amazing view of the breathtaking Sitia bay. There is also a luxury bathroom with hydro-massage on the same floor. The wooden stairs lead to the bedroom of the second floor with a twin wooden bed and a lovely terrace with two sun lounges, boasting magnificent panoramic views of the sea, sunset, town and surrounding landscape. Outside, there is a private swimming pool (30m2), which is filled with crystal clear fresh water, as well as sun beds, a lounge shaded by a uniquely designed natural stone pergola, a built-in stone BBQ, a traditional stone oven, a handcrafted marble dining table and marble benches. The gardens are landscaped with the use of natural stones and sea pebbles. The villa is gated offering both privacy and security. Blue Horizon is located on the beautiful north-east coast of Crete, in a ten-minute walk from the picturesque town of Sitia. 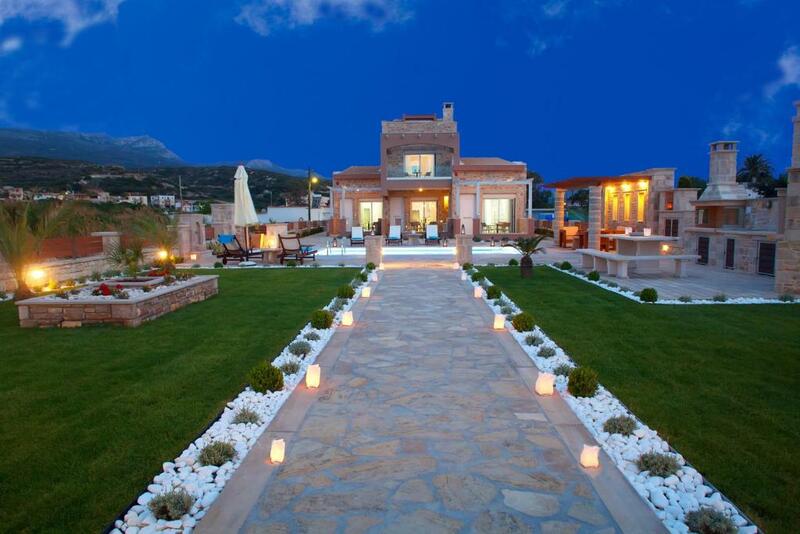 It enjoys a privileged seaside position overlooking the blue waters of Sitia Bay. Sitia is an attractive seaside town in a region still unspoiled by mass tourism. A long sandy beach offers the pleasures of sand, sea, swimming, windsurfing and other water sports.The beaches of Sitia have been awarded with the EEC Blue Flag. Nearby Sitia, there are numerous beautiful beaches with crystal clear water, local tarerns and seaside restaurants, where you can taste the popular cretan cuisine, cafes and beachbars as well as many tourist attractions, museums, archaelogical sites and many more worth visiting! The whole area around Sitia is a land of contrasts, with high mountains, hills and valleys, caves and sandy beaches with their little coves, ready to be explored! Overall, Sitia is ideal for holidays for those who seek a relaxing time, in a picturesque and welcoming place, full of Cretan tradition and friendly, hospitable people! Sitia Airport is less than 2 km away and Heraklion Airport is located 129 km away. Private on-site parking is provided free of charge. House Rules Blue Horizon Villa & Suites takes special requests – add in the next step! Blue Horizon Villa &amp; Suites accepts these cards and reserves the right to temporarily hold an amount prior to arrival. Blue Horizon Villa & Suites accepts these cards and reserves the right to temporarily hold an amount prior to arrival. Please inform Blue Horizon Villa & Suites of your expected arrival time in advance. You can use the Special Requests box when booking, or contact the property directly using the contact details in your confirmation. We loved this beautiful Villa which was luxurious but with a lovely homely feel. It really is as wonderful as the pictures. We stayed in the maisonette. Spotlessly clean and very well equipped they really had thought of everything and if they hadn't thought of it then it appeared within a few hours of you mentioning it! Despina and Kostas were extremely welcoming and helpful with recommendations for restaurants, beaches and helping organise car hire. There is a wonderful outdoor kitchen area where we had a barbeque one evening, charcoal and fire lighters provided by Kostas within a few hours of mentioning using the barbeque😁 The Villa is situated perfectly, only 5-10 minutes walk from the little harbour town of Sitia and literally a stone's throw from the beach. There is a large choice of restaurants, all thriving and the atmosphere is lovely. This is not a big tourist area. Not once did we get hassled outside a bar or restaurant. There is a good size supermarket 10 minutes walk away called Ariadne which we used a lot as we only hired a car for three days. There was also a large Lidl just on the outskirts of Sitia if you have a car. This is a bit cheaper and has more international brands. We hired a car for a few days which I advise you do if like us you don't drive from the airport. The scenery around Sitia is very mountainous and dramatic and there are some beautiful beaches to explore. As other guests have mentioned, it is quite a long drive from the airport , just over two hours but don't let that put you off. As a result Sitia is not a touristy place, we only saw one other English family. We would like to thank Despina and Kostas for making our stay at Blue Horizon so wonderful. The little touches of gifts at the end of our stay and delivery of hot doughnuts and local delicacies during our stay were really appreciated. We would definately like to visit again sometime. Our kids are 12, 9 and 8. This is probably not the best property for small children due to the stairs. For us it was perfect.